An exquisite pair of side tables, designed and made by Dorset furniture maker Simon Thomas Pirie in memory of his brother, goes on show for the first time as part of Dorset Art Weeks. ‘The Torii design has a strong emotional connection for me, a reminder of a very special trip to Japan in 1994 with Donald when he was terminally ill. Japan and those memories have been a lasting influence ever since, and these tables are the most physical manifestation of that. Donald died in 1997. He was surrounded by all his friends and family when he passed away. ‘I don’t suppose there is an ideal way to die, but this came close,’ said Simon. ‘He had been diagnosed HIV positive almost 10 years before so we all knew time was limited and he went through the pain of watching his partner die within four years of the diagnosis. He was determined to live what was left to the full so took various people on trips of a lifetime – my mum to China in 1994, and me to Japan in 1995. To say that trip was special was an understatement. ‘From being a university academic (he taught Polish and East European languages and literature) he then began to turn his attention to writing poetry himself and those trips were part of the transition from critic to artist for him. It was a joy for me to watch and in some small way help. 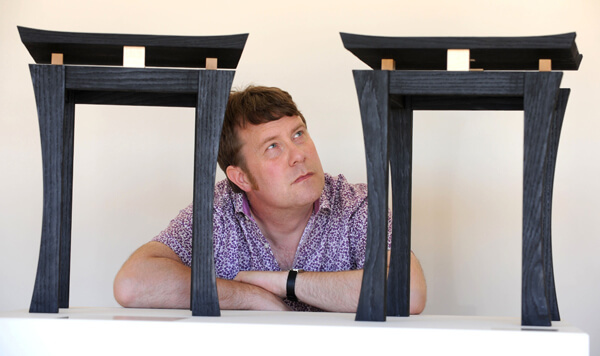 As a tribute to his brother and the creativity that inspired them both, Simon has added one of Donald’s final poems to the last Torii table set. ‘Of course the whole episode means a lot to me but I don’t want it to seem sad or morbid. The design and the final tables are a celebration of life and creativity and I hope people will see them in that light’. Simon’s studios at Rogers Hill Farm, Briantspuddle, will be open throughout Dorset Art Weeks (26 May to 10 June). Simon will be exhibiting a variety of bespoke furniture and signature pieces, including dining tables, chairs, cabinets, occasional tables and new outdoor benches, all made from sustainable British hardwoods. Many of speculative pieces are being auctioned and bids can be left throughout the 16 days of Dorset Art Weeks. It’s a great opportunity to buy a bespoke piece at a fraction of the commission cost. Simon will be joined by Liz Tyler and Peter Ursem, both highly regarded and collected artists in their own fields.